Neuheisel is reportedly considering ex-trojan Mark Carrier for Defensive Coordinator — What part of “Rivalry” doesn’t Rick understand? I’M TRYING TO STOP AN OUTBREAK, AND NEUHEISEL IS DRIVING THE MONKEY TO THE AIRPORT!!!!!! How can Mark Carrier possibly motivate a team of Bruins to hate/destroy his beloved usc? At least when Ken Norton, jr. joined sc, he hated UCLA for NOT hiring him first, so he could easily channel that hate into firing up the trojans for the Rivalry games. On the other hand, Henry Bibby didn’t hate UCLA, and therefore sucked as a usc Coach facing UCLA. Likewise, Norm Chow still liked usc, when his Offenses got pummelled by the trojans in all three of his years in Westwood. Players play better when they are highly motivated, and a healthy dislike of your ARCH RIVAL is a key factor in feeling like you HAVE to go out there and kill them on the field or court. Ben Howland has failed in this respect, because he always downplays the Rivalry. It would be a thousand times worse for a “Bruin” Coach who undeniably bleeds Cardinal and Gold. Doesn’t Neuheisel realize that one of the reasons he’s in the Country’s hottest hot seat is his pathetic record against usc? Doesn’t he realize that a huge chunk of Bruin fans are disgusted with Rick getting outcoached by a weasel like Lane Kiffin, and with three straight uncompetitive losses? Does he not see how the trojans and their fans TAUNT the Bruins at the start of the 4th Quarter, when the game is already in the bag? How is he going to convince his players how important the Rivalry is to UCLA, if he lures a FAMOUS trojan hero across enemy lines? If it’s okay to switch allegiances, why should anyone care about the pride involved in winning the City Championship? Why doesn’t Rick just invite O.J. Simpson to give the Bruins a pre-game pep talk? If you don’t like all of THOSE reasons to pass on Carrier, how about the fact that he has no experience as a Coordinator? Why make UCLA a bunch of guinea pigs to experiment on, as Carrier gets a training ground to hone his craft, until he ultimately takes his talents to usc, when the ancient Monte Kiffin finally hangs it up? And how about the fact that the other candidate for the UCLA D.C. position is Randy Shannon, who is dramatically better-qualified for the job? Shannon was the Head Coach of Miami, where he did not excel, except on the DEFENSIVE side of the ball. AND, before that, he was Miami’s Defensive Coordinator, and perennially produced one of the highest-ranked Defenses in the entire Country. Shannon already has the respect of recruits, including one of the most sought-after Linebackers in the Nation. WHY is Carrier even being mentioned, when Shannon is available????? And Shannon, with his big-school Head Coaching experience, also gives UCLA some flexibility — Just in case Neuheisel flounders in his plans to be more hands-on with the new Offense, UCLA could fire Neuheisel before things get completely out of hand, and Shannon could take over without the team missing a beat. Maybe that’s why Neuheisel wants the inexperienced Carrier instead? I understand that some fans want to get away from Coaches with UCLA/Donahue ties, in order to overhaul the 20-year trend of UCLA sucking on the gridiron, but Shannon has no Bruin ties, so picking Carrier ovder him would be absurd. And speaking of picking… UCLA does NOT need to invite a trojan into thier midst. Do the Bruins really need to adopt the attitude of people who pick their noses and wipe it on their teammates, ala Mark Sanchez? By the way, 4 million more people just got to see that exercise in trojan class, when Jay Leno re-played the clip on his show on Monday Night. Leno’s less-than-clever accompanying joke was: “That’s why the Jets wear green.” But the REAL joke is ex-trojan Sanchez, himself. And speaking of trojan class, Stafon Johnson held a Press Conference to simultaneously proclaim his ongoing, undying love for usc, AND announce that he was suing them over his barbell accident. He claims that the sc Strength & Conditioning Coach (and Steroid Pusher?) NOT ONLY was negligent in not supervising Stafon’s lifting session, but that the guy actually bumped into the barbell in question, and knocked it down onto Stafon’s throat. Apparently, the Coach was watching a bunch of other trojans — who weren’t even working out — when his body hit the weights that Johnson was about to grab, making them fall onto Johnson’s neck. I’d like to hear from the two commenters now, who implied that usc could not possibly be at fault in this incident. 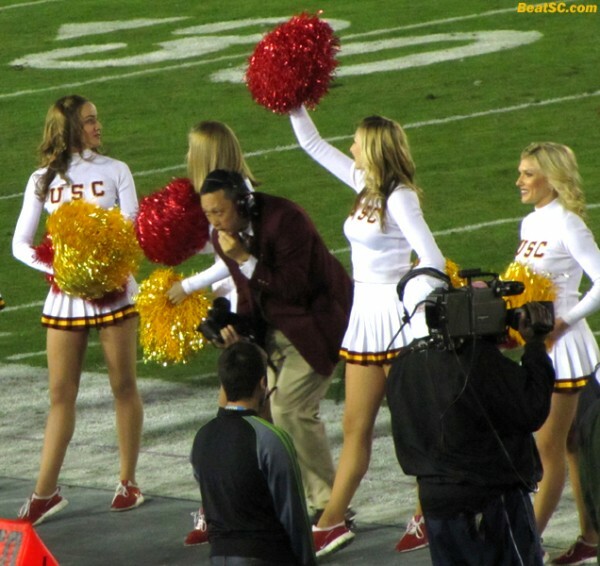 By the way, that S & C Coach left usc, and went to coach for Pete Carroll in Seattle last year. Naturally, Carroll isn’t bothered by the guy’s cavalier attitude about safety, let alone all the Steroid accusations. And who would know better about those accusations than Pete the Cheat? Maybe Carroll also knew about the method used to beat the Drug Testing. Johnson is suing the S & C Coach and the University, for Medical Bills, Pain and Suffering, and lost income, since the injury impeded Johnson’s ability to prosper in the NFL as much as he could have. The number $25,000 was mentioned in the Press. Johnson’s lawyers said that they tried for months to negoitiate an out-of-court settlement with usc, but that the school was unreasonable. Of course, sc denies this, saying that they are “sorry” about the injury, but that they are not responsible, and that it is a shame that Stafon felt the need to bite the hand that fed. With any luck, this case will get really nasty, and Stafon can expose them for something much worse than negligence, like how much money they lured him with during his recruitment, how many Steroids — and envelopes of cash — that they gave him while he was there, or how he never attended a class or took an exam in all his years at the school. All he had to do was THREATEN to spill the beans — With sc’s sanctions Appeal currently hanging in the balance, they would have settled pretty damn quickly. Instead, he just sings their praises, with his hand out. And just like you ask yourself while watching Judge Judy — What kind of loser actually takes a loved one to court? I ask again: Is this REALLY the kind of mentality that Neuheisel wants to invite into the UCLA camp? This SCuzzy attitude would infect the whole team, spreading quickly, akin to a Plague-like epidemic of SCurvy or SCabies. This is one instance where the idiom “If you can’t beat ’em, join ’em does NOT apply. "PLEASE DON’T HIRE CARRIER… OF S.C.-LIOSIS" was published on January 25th, 2011 and is listed in Blue & Gold News, News from the Dark Side, UCLA/usc/Cheerleader Photos. I’d like to hear from the two commenters now, who implied that usc could not possibly be at fault in this incident. I didn’t imply anything about usc not /possibly/ being at fault. If you go back and read my comment, I specifically started off by saying that my opinion was solely based on what you had put in your post. And nothing in your original post mentioned Johnson being bumped by the s&c coach while in a room full of other players. The only reason I can think of for UCLA to want to hire carrier is $. I hope UCLA will not be penny-wise and prideless-foolish. As I said, I didn’t see a reason why usc would be at fault if the guy was off lifting on his own. If student X decided to go off and lift alone at a facility owned by the University of Y and dropped a barbell on his own throat, that’s just straight personal injury nonsense. As far as this new info, I think it muddies the waters as far as culpability. Anyway, that’s all I’ll say. I’m not out to defend usc or its players. Just looking at this from a strictly legal point of view.